Dogs and cats deserve serious protection from fleas and this is what Advantage, a Bayer product, is able to offer. 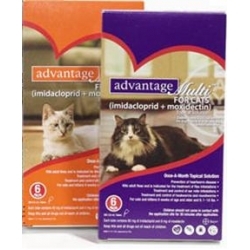 You can choose between Advantage for Dogs and Advantage for Cats, two different products entirely, but containing Bayer's active ingredient, the medicine Imidacloprid. This is the same product recommended by veterinarians for its high level of effectiveness at not just killing fleas, but ending the flea life cycle, as well. Advantage is designed to work fast, killing 98% of the fleas infesting your dog or cat within just 12 hours. Each application, which you apply from the tubes the product comes in, will offer a full 30 days of protection for your pet. Due the fact that Advantage works so quickly, your pet will begin experiencing relief usually within minutes of the application. However, the fleas will will continue to be killed as the application continues working. Not only does the active ingredient in Advantage kill adult fleas, it acts to sterilize the female flea so that her eggs will not hatch. The larvae anywhere around your pet, even on furniture or the floor, are also killed so they cannot grow into adult fleas. That means the flea life cycle is ended and your dog or cat will finally get some peace. Advantage is safe for puppies 7 weeks or older and kittens 8 weeks or older, as well as pregnant or nursing mothers. Since it is resistant to water, it will not wash off due to rain, swimming or if you give your pet a bath. Advantage Multi offers all of the above benefits plus protection for heartworm, a deadly parasite that can affect cats and dogs alike. Hookworms and roundworms are also eliminated by using Advantage Multi. This superior protection relies on Bayer's active ingredients Imidacloprid and Moxidectin to get the job done quickly. Advantage is a once a month topical flea treatment for dogs and puppies 7 weeks or older and cats and kittens 8 weeks or older. Advantage stops fleas from biting in 4-5 minutes and kills 98-100% of the fleas on dogs and cats within 12 hours of application. Advantage kills re-infesting fleas further infestation for at least 4 weeks. Place the Advantage applicator tip through the animals hair to the skin level. On cats, apply to skin on neck at the base of the skull. For dogs up to 20 lbs, apply to skin on back between the shoulder blades. For dogs 21 lbs or over apply the contents of one tube to 4 or 4 spots along the skin on back from the shoulder to the tail. Do not get this product in the pet’s eyes or mouth.